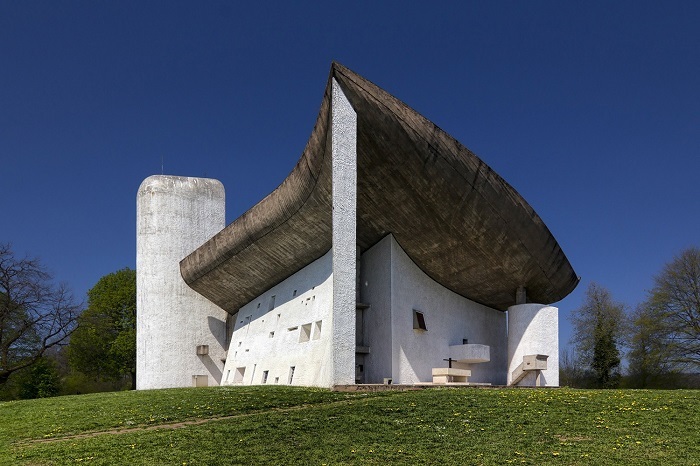 The Notre Dame du Haut, also known as Chapelle Notre-Dame-du-Haut de Ronchamp, is a chapel and also one of the most important examples of 20th century religious architecture, located in the commune of Ronchamp, in the region of Bourgogne-Franche-Comté in the eastern part of the French Republic. Designed by the Franco-Swiss architect Le Corbusier in 1953 when the groundbreaking began, the chapel was finished and consecrated in 1955, making it one of the most important religious places where 80,000 visitors are visiting it each year. 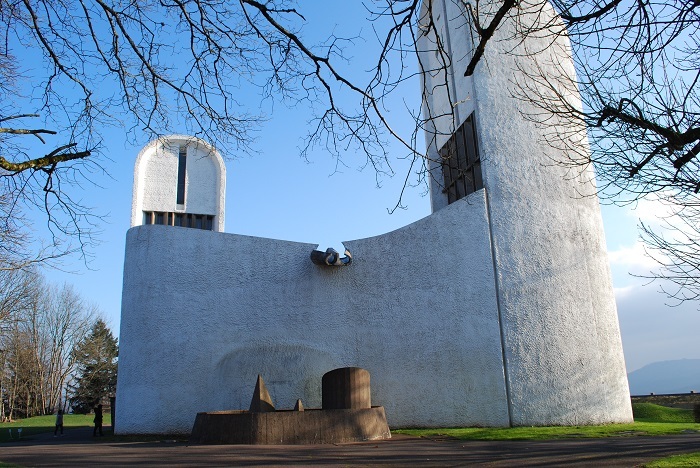 Previously, there was a chapel which was dedicated to the Virgin Mary that was built in 4th century, however, it was destroyed in the Second World War. 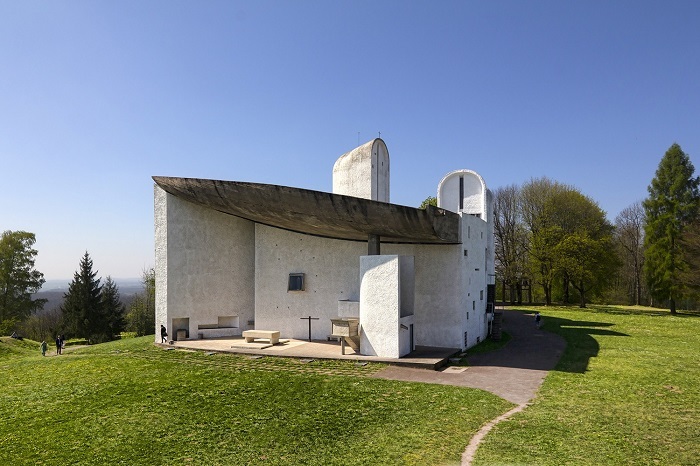 Today what we can see on the hill of Bourlémont is a modern and simple designed chapel with two entrances, one main altar and three chapels beneath towers. Even though it appears to be small, the whole structure is much more complex and also powerful. 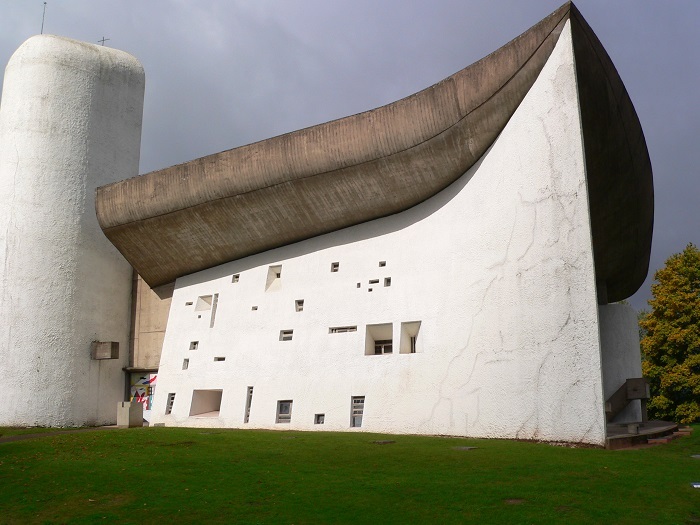 The main part of the structure consists of two concrete membranes that are separated with a soace that is some 2 meters (7 feet) wide, forming a shell that constitutes the roof of the building. 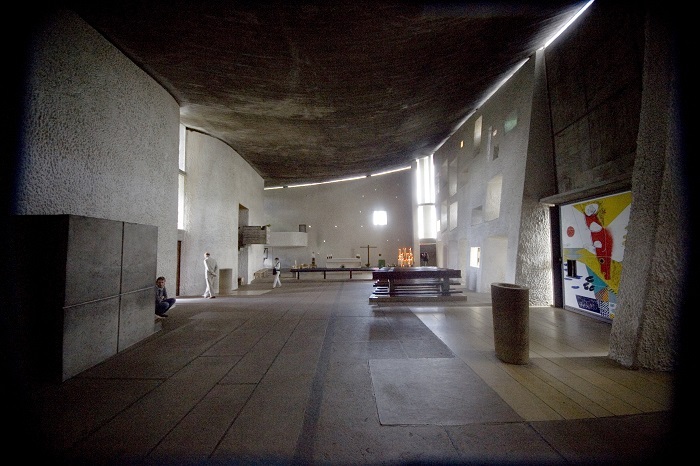 The roof itself is upturned and supported on columns embedded within the walls, and the interior space that is between the walls and roof is filled with clerestory windows, in addition to the interesting asymmetric light from the wall openings that gives the impression of soft and indirect lightning for further reinforcement of the sacred nature of the structure. 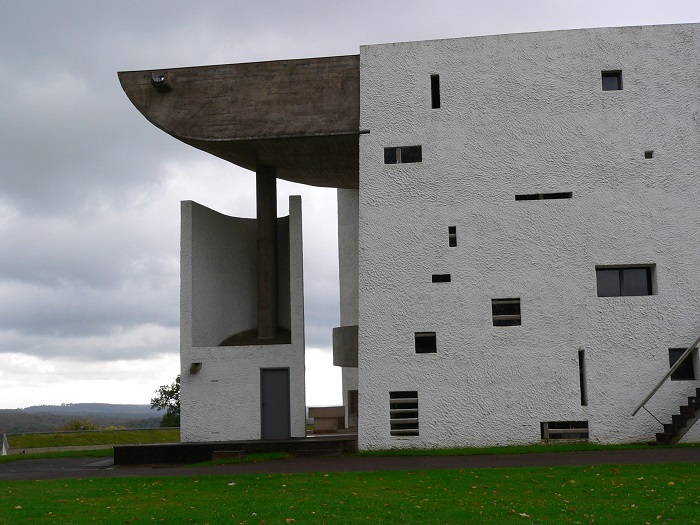 The walls which have no structure that was built against them, otherwise known as buttress, are constructed so good that they offer great stability to this rough masonry, and as the roof follows the natural slope of the hill down towards the altar, it gives the impression that the architect was working in accordance with the nature. 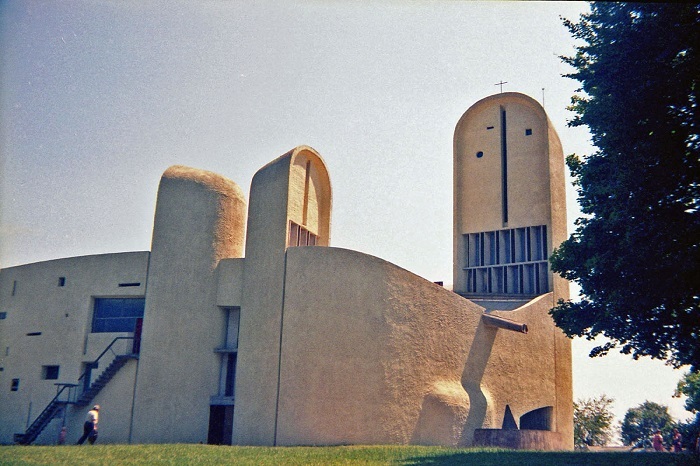 The exterior of the chapel is colored in white, whereas the interior is also colored white, however, the ceiling is gray and left as when it was finished, the flooring is interestingly constructed of cement and stone to give the impression as it is a chapel from the past, filled with colors from the colored glass that was placed on some of the windows. 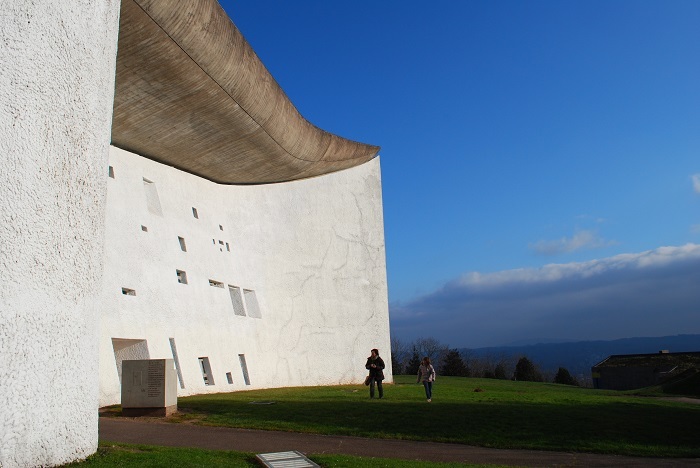 Still, the pièce de résistance of the whole religious structure is the South Wall, which is a story for itself. 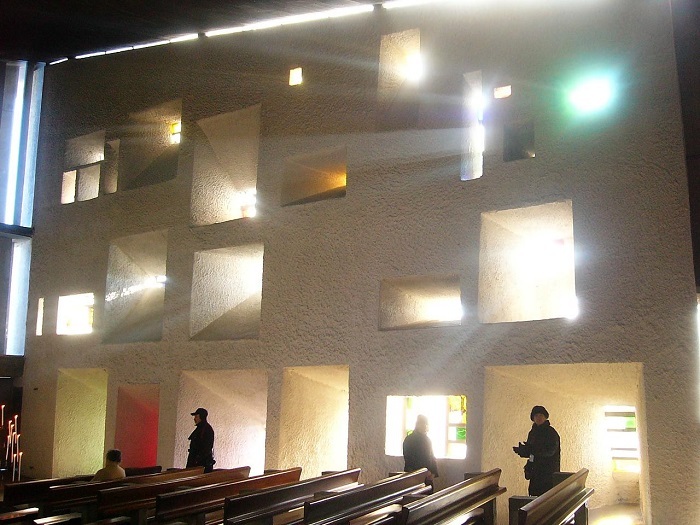 Le Corbusier has spent plenty of time to design the interesting form of this wall, where as it moves from east to west, it curves towards the south, and to be even more unorthodox, there are different size windows that are scattered in an irregular pattern across the wall, with openings that slant towards their centers at varying degrees, thus letting in light at different angles. Another interesting and important historic fact is that the architect willingly decided to fill the South Wall with the rubble from the previous chapel that stood at the location, making the old chapel to be still present and overlooking the small city at the foot of the hill.